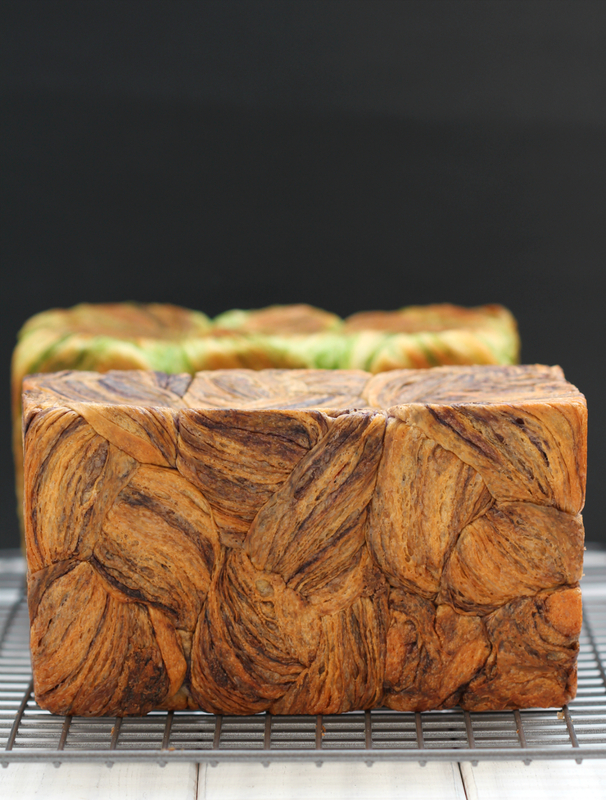 my bare cupboard: Danish loaf bread - 3 ways - Cocoa / Matcha / Ube ( purple yam ) "
How's the Christmas shopping er baking so far ? I baked these 2 loaves , matcha and ube , few weeks back , you know , just to remind myself whether it's still easy to roll a buttery dough after more than 2 years of not doing it . Yup ! It was ! 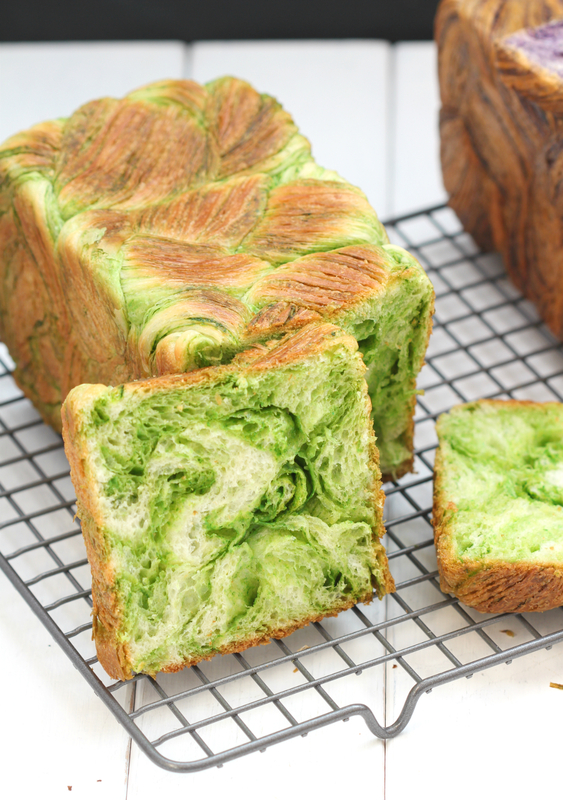 If you make matcha danish loaf 5 times within a two-week time frame , I'm pretty sure the last one will yield a better result ( fingers crossed ). I usually do the 3-times trial and error when it comes to bread making and if I still can't get it , I just move on to another new recipe . 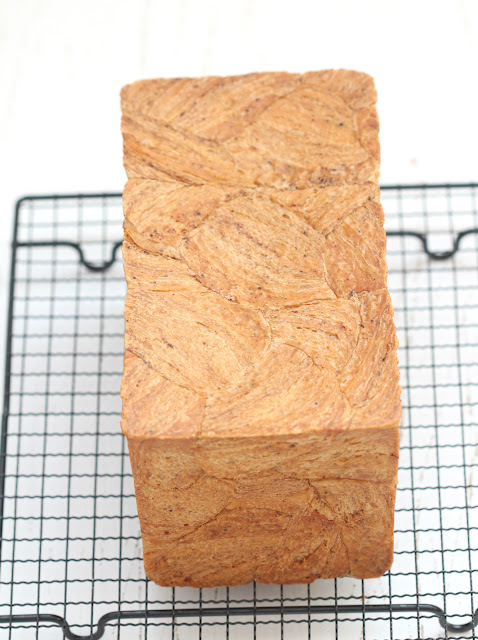 But not with danish loaf , yeah , because even that 1st ugly bake , the loaf tastes out of this world ! Okay , it was probably the copious amount of butter hee hee ! The previous recipe has only 300 something grams dough and 113 grams butter insert , imagine making it for the first time ?! The dough in this recipe is more substantial so rolling it longer and wider is much easier . 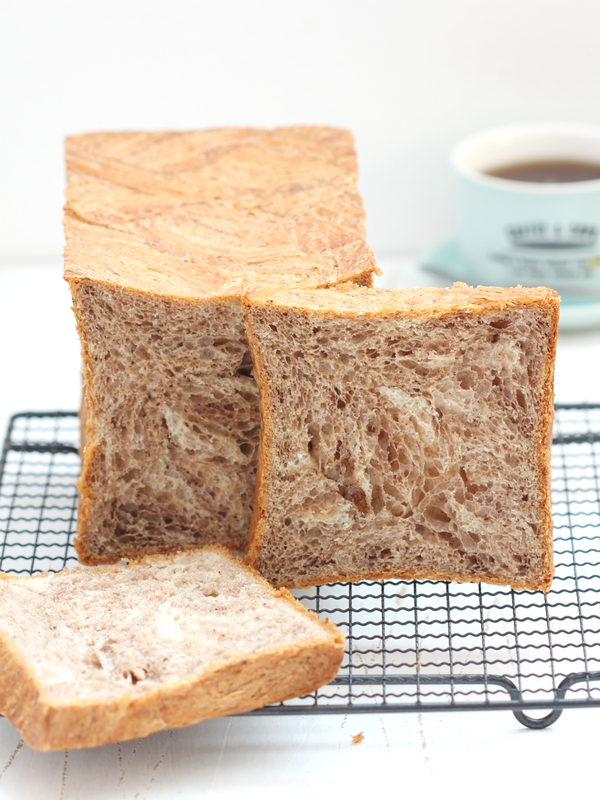 These loaves are made the same way as croissants except danish bread dough is kneaded just like most Asian-style bread . 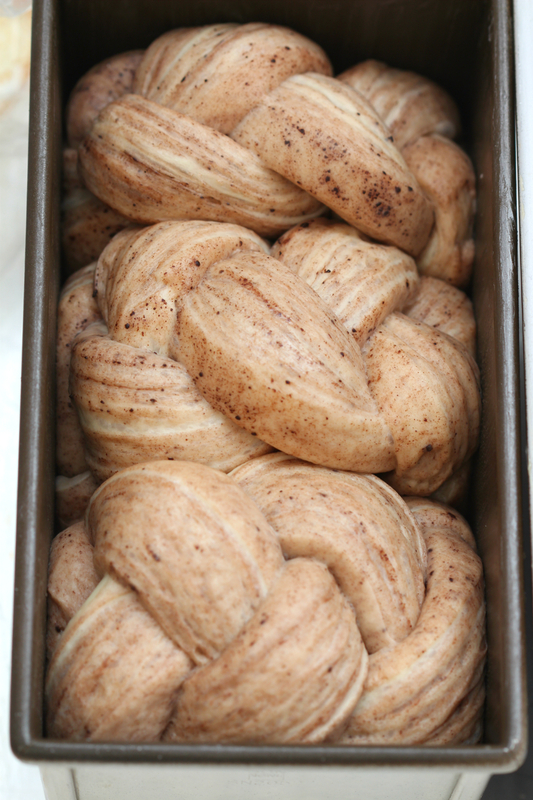 And danish dough is not rolled as thinly as croissants . 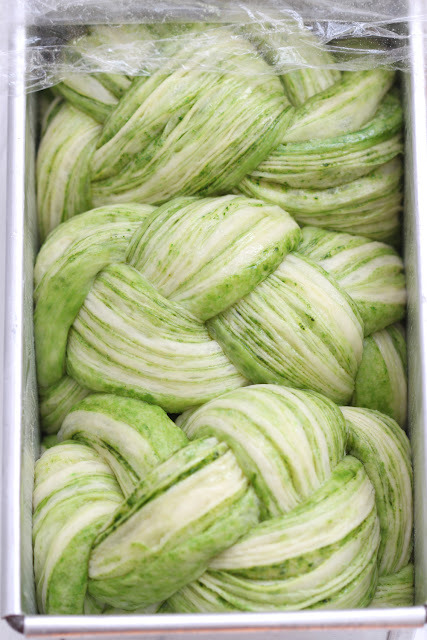 I decided to add some flavourings to butter and each ingredient certainly adds an interesting swirls of colour and delicious flavour . I made the cocoa version 2 days ago and made 4 turns this time . I think I'll stick with 3 turns in making danish loaf from now on . 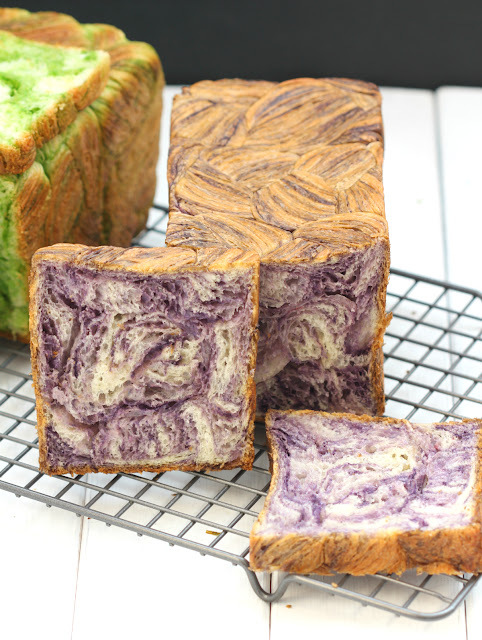 The layers in the crust are much more finer so it doesn't look as distinctive as the layers in both the matcha and ube/purple yam version . Use good quality butter in making danish loaf , the higher the butterfat in butter , at least 82% , the less it will melt as you roll the dough as the texture is more drier compare to those butter with less fat . The flavour is much more better as well . 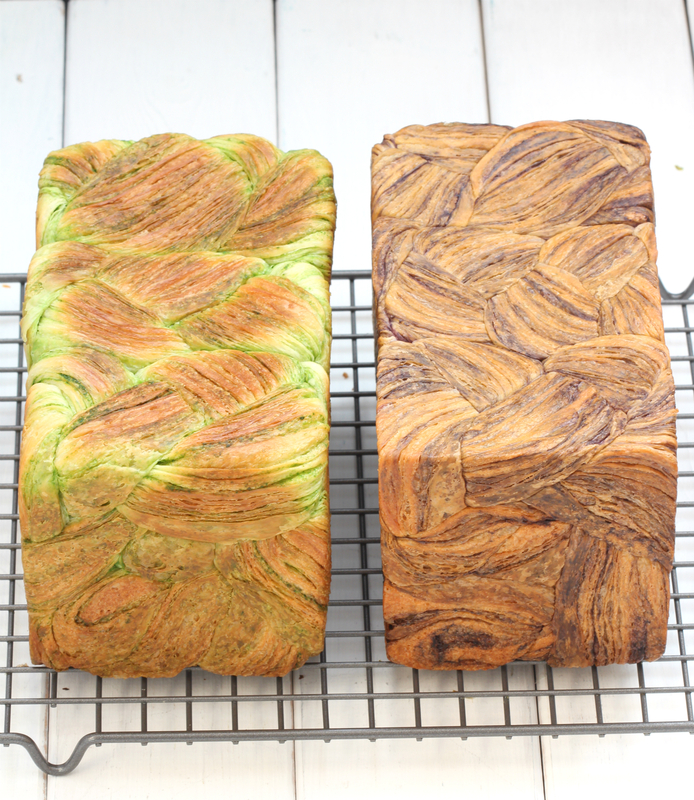 I used Isigny Ste Mere in matcha and ube/purple yam loaves and Lescure in the cocoa version . 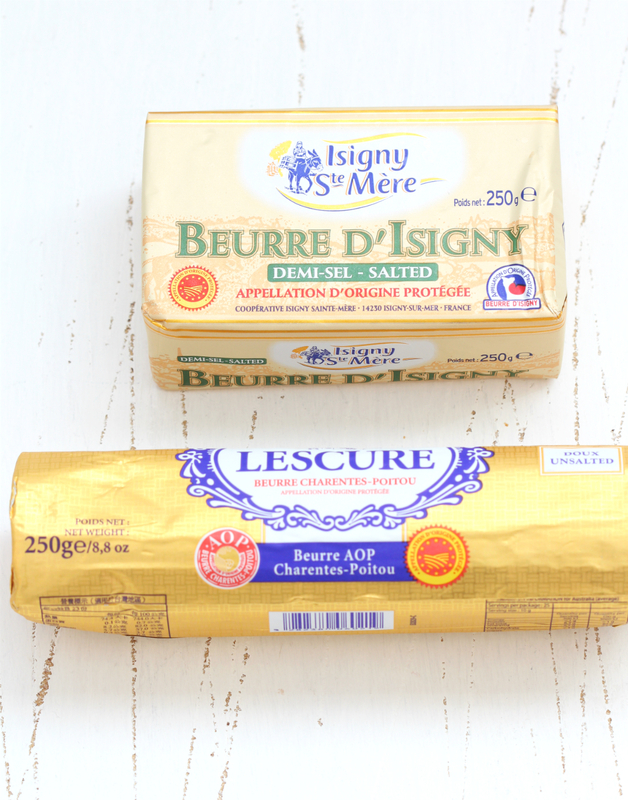 Photo of Isigny Ste Mere butter below is salted , I ran out of the unsalted ones weeks ago . The 3 baking shops that I visited doesn't have stocks anymore . Yup , French butter shortage is real tsk tsk ! Texture of the crust is shatteringly crisp and the crumb is pillowy-soft . Best eaten the same day it is made , the crust will lose its crispness the next day but will stay soft for days stored at room temperature . I usually toast slices in a non-stick pan for about 2 minutes on each sides , crust may not be as crisp as the day it was made but still delicious nonetheless . * Make the dough : You can knead the dough manually , use stand mixer or bread machine . Knead dough until it pass a window pane test , about 20 to 30 minutes - this is important if you want an enriched bread to be soft for days . 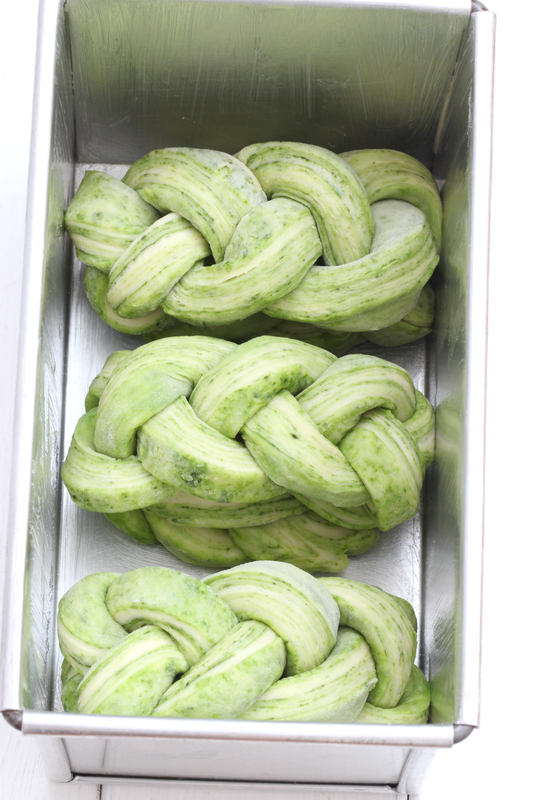 Chill the dough in the fridge overnight to proof . 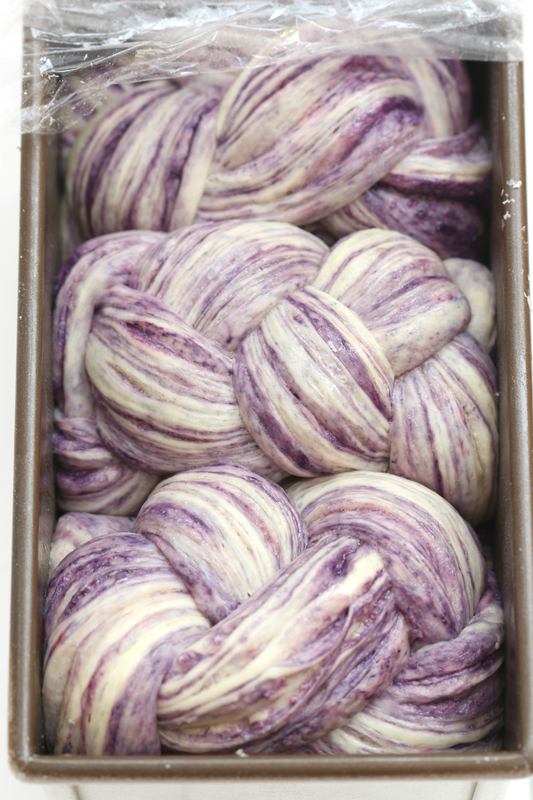 Take out dough from the fridge and form into a smooth , round ball . 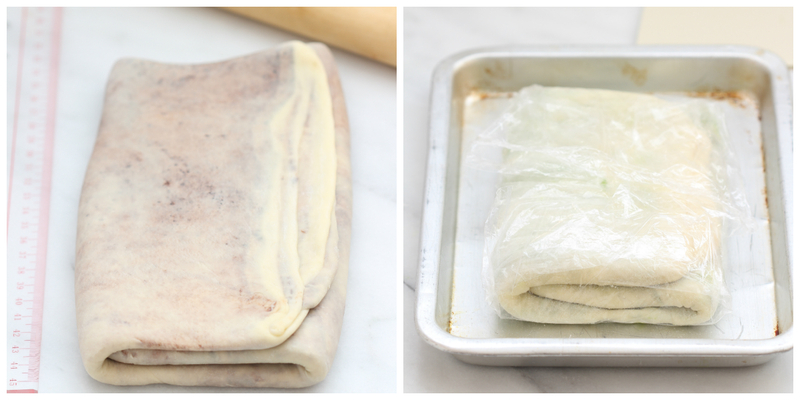 Cover with tea towel and let rest for 20 minutes . * Make the butter insert : Cut butter into pieces and lay them down side by side on the parchment paper . 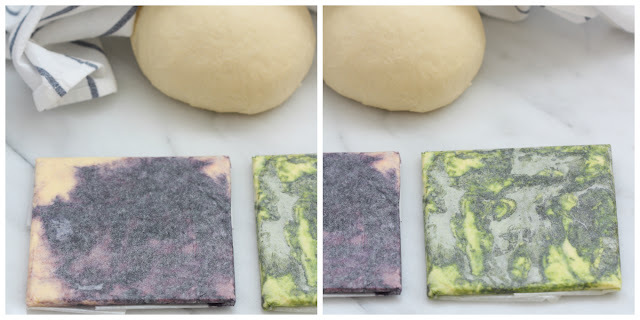 Sprinkle cocoa / matcha / ube ( purple yam ) on both sides of the butter , pound butter with a rolling pin to soften it a bit , roll evenly and shaping it into a 5-inch square . Chill overnight before using . 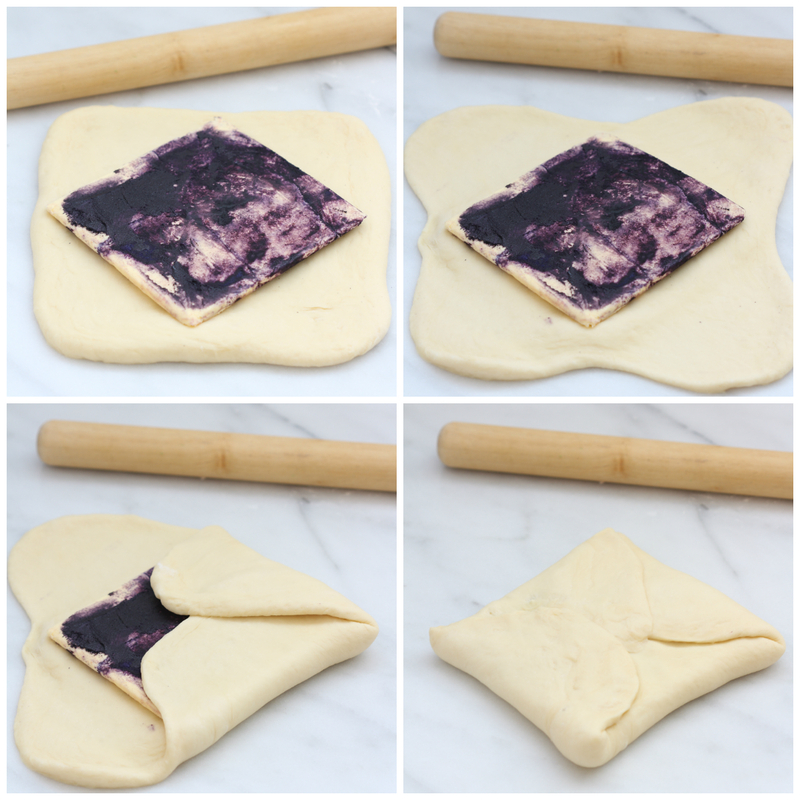 * Roll out dough into 8 x 8-inch square , place butter at an angle , just like a diamond . Roll out each flap/sides into about 4-inch length . 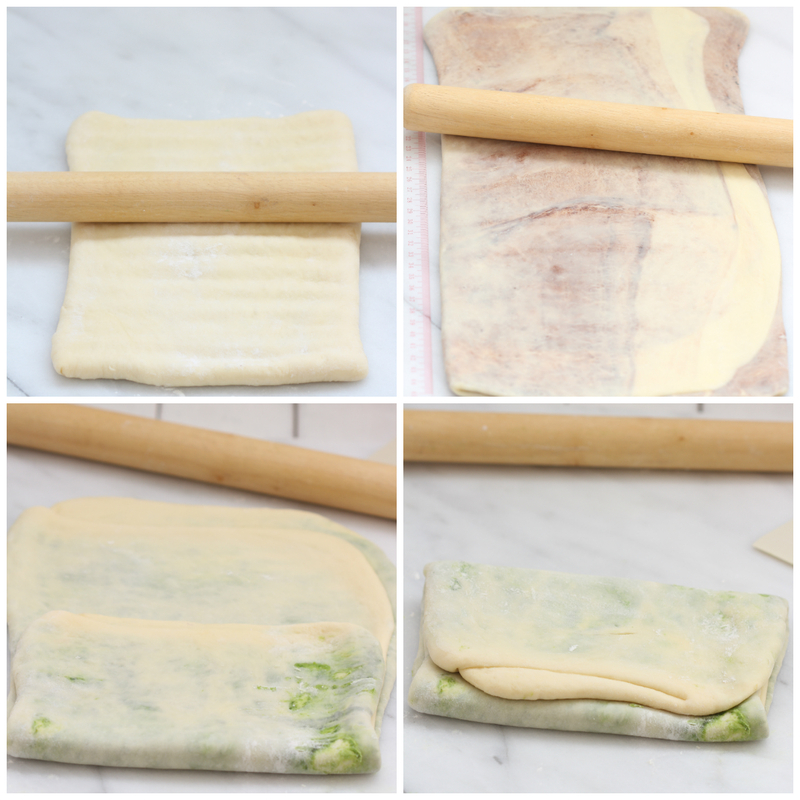 Fold each of the flaps to encase the butter within the dough , press edges together to seal . * Sprinkle some flour on the work surface , also on top of the dough to prevent sticking . Using the rolling pin , press it up and down , creating ridges on top of the dough , this will make both dough and butter adhere better so as elongating it . Do this before you start rolling out the dough . * Roll out dough into 8 x 15-inch rectangle , do the 3-fold - fold one short side at two-thirds of the length of the rectangle then the other short side over it making 3 layers . * This is the 1st turn , rotate dough at 90 degrees , the opening should be on the right side , just like a book . You'll have a 5 x 8-inch rectangle after each turn , do this 3 times . Wrap dough in a plastic wrap and put it into the baking sheet then place in the freezer for 20 minutes after each turn . * Remember to fluff / lift the dough often as you roll it to prevent sticking . Sprinkle some flour as needed as you roll the dough and brush off excess flour using a pastry brush before you do the fold . If there are some holes or tear on the dough , lightly sprinkle with flour and gently tapping it with a finger . * After 3 turns , freeze the dough ( also 20 minutes ) for the last time . * Lightly grease an 8x4-1/2x4-1/4 inch non-stick pullman tin . If using an aluminium pullman tin , grease generously . * Roll out dough into 6 x 16-inch rectangle , the length should be twice of the pullman tin . 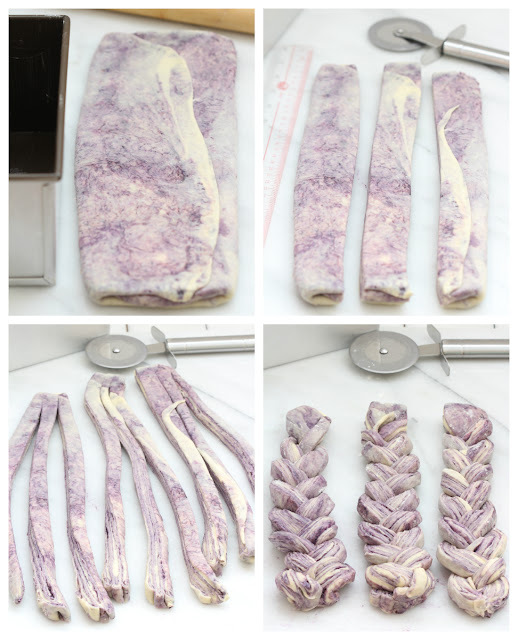 Cut dough into 3 equal strips ; cut strips into 3 equal pieces , not cutting the top part through . 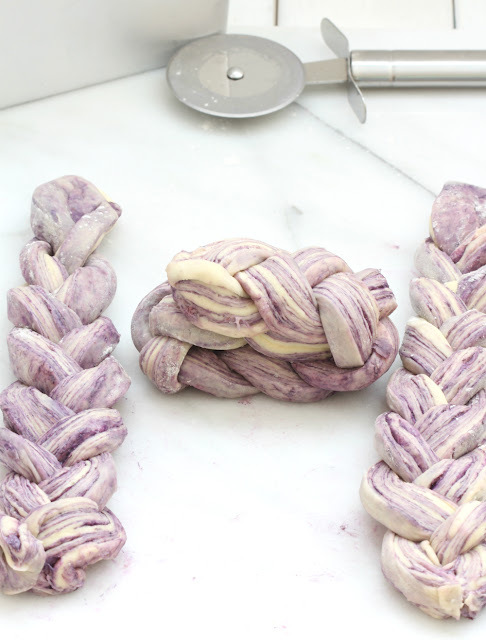 Do the 3 strand braid , making sure the layered part is exposed at the top . If the strips has gone a bit soft , sprinkle some flour before braiding it . * Turn down the braid up-side down and fold into 3 layers , the top of the braid should be in the middle and the lower part should be at the bottom . 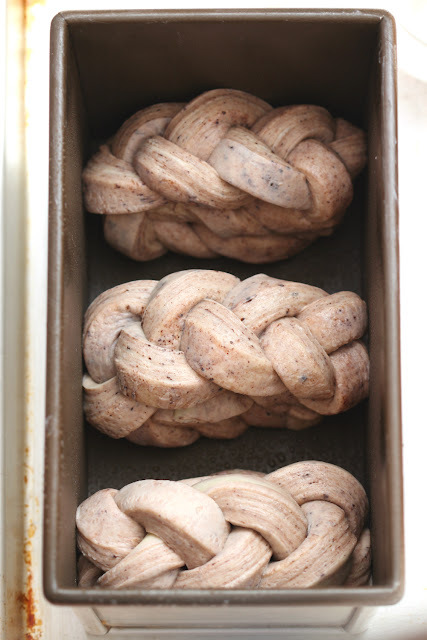 * Place the stacked braid , middle side up in the prepared pullman pan , spray dough with water to prevent drying . * Cover the pan/tin with plastic wrap / tea towel , place it on the baking sheet and let proof until it fill up about 90 % of the tin or nearly to the rim , 4 to 4 1/2 hours depending on the ambient temperature . * Preheat oven to 210ºC . * Put the cover of the pullman tin , let proof for another 10 to 20 minutes , again , depending on the ambient temperature . * Bake for 35 - 40 or until crust is golden brown . 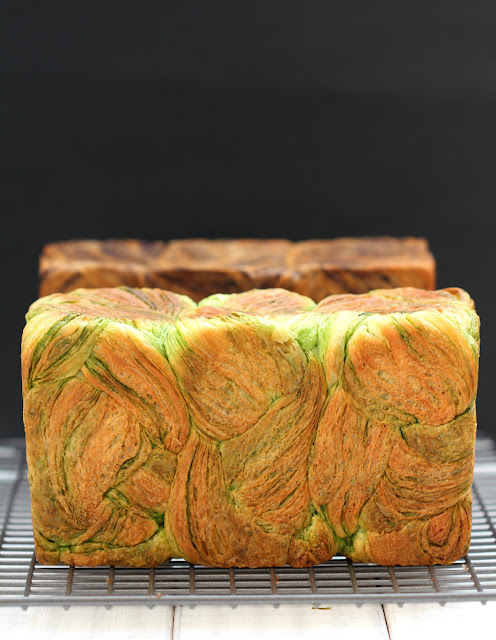 * Take out danish loaf immediately out of the tin and place in a wire rack to cool completely before slicing . Lots of work and patience..but definitely worth it. I have ZERO control over those beautiful loaves. Good job, Anne. Thanks for sharing your great baking experience. Hi Anne, ho..ho..ho Merry Christmas and Happy New year to you. Wishing you all the best in 2018. 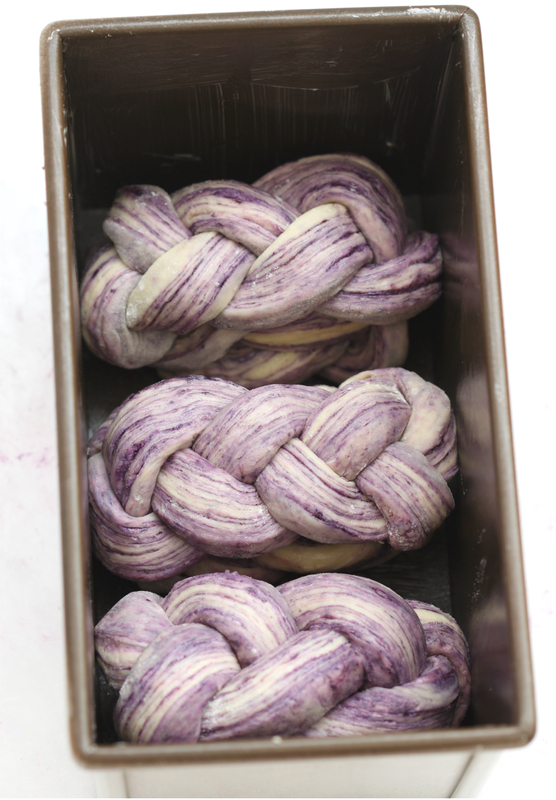 That's a very nice bread, very well baked and your braid look so neat and beautiful. Look so fluffy, throw some over please. hihihi...See ya.